As a child, I always considered myself extremely lucky. My mom never, ever made me drink milk (citing the Mediterranean’s intolerance to dairy and her general dislike for the stuff), she never insisted we buy cafeteria lunch (THAT would have put the kybosh on my early-in-life appreciation for good food), instead I got to bring slices of Genoa salami and provolone or left over pasta from the night before. And growing up, there was always a particular item in my family’s kitchen that made me feel extra special- Jam. I did not know that you could buy jam in the grocery store until I was about five and my daycare provider tried to add a purple, gelatin-like substance onto my peanut butter sandwich, also known as “grape jelly”. Shudder. As you might guess, this did not go over well. I thought everybody’s freezer had endless jars of strawberry, raspberry, apricot, blueberry and blackberry jam. At five years old, the thought of a jam-less kitchen was mind-boggling. All these years, watching my mom and Nonna spend summer afternoons cleaning and smashing berries I was under the distinct impression that homemade jam was a really big deal. Something that requires lots of love and attention and skill and uses a recipe most likely introduced by Great Grandpa Tocco who owned a produce truck. 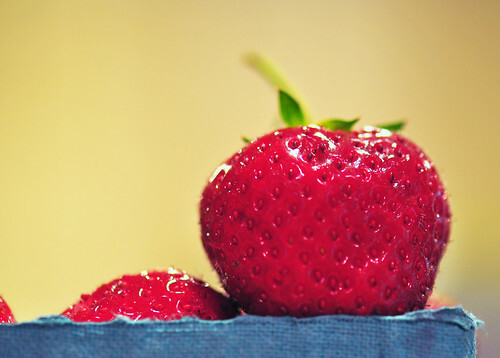 A couple of weeks ago, my mother watched as the very first strawberry ripened in the Pioneer Valley. Excuse me? All these years our family has been ripping the jam recipe off those stupid little yellow boxes of Sure-Jell? Seriously? But wait. We must tweak it to make it better, no? Again my mom gives me an exasperated look. Surely Nonna must add her special touch the jam? Nope. I called Nonna and all she had to say about it was to be sure and cook the blueberry jam, otherwise it doesn’t taste like anything. And does she have a recipe for cooked blueberry jam? You bet. It can also be found ON THE BACK OF THE YELLOW BOX. Right. My mom, anxious to get started finally says, well you know, I don’t like to crush the strawberries as much as the box tells you to. So there you go. I’m giving you a recipe that can be found on the back of the box of fruit pectin with exactly one modification: don’t over crush the strawberries. When we celebrate the Fourth of July at Nonna’s Cottage, a huge tub, yes tub, of strawberry jam is issued at the beginning of the week and is slowly gone by Friday. No joke. Even though it’s off the box, there’s still no getting around it. Jam, particularly strawberry jam simply tastes like a mouthful of summer. 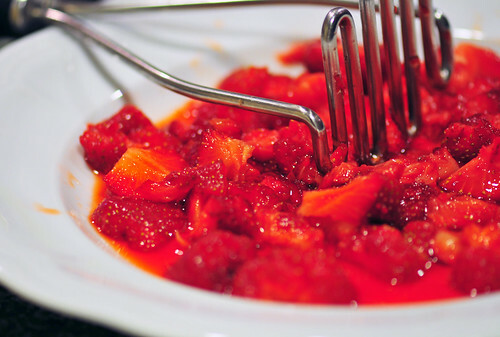 Gently crush the strawberries using a potato masher (when all is said and done you still want to recognize them as strawberries). 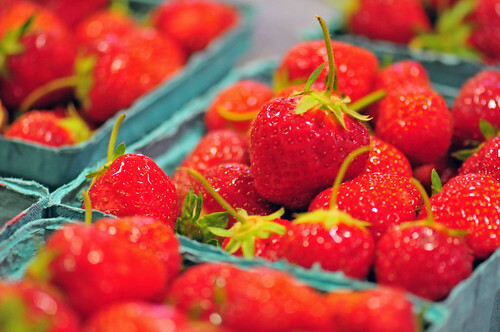 Stir sugar into crushed berries, let stand for 10 minutes. Stir pectin and water in a small saucepan; bring to a boil, stirring constantly. Let boil for 1 minute. Remove from heat. Stir pectin mixture into fruit, stirring constantly until sugar is completely dissolved for 3 minutes. 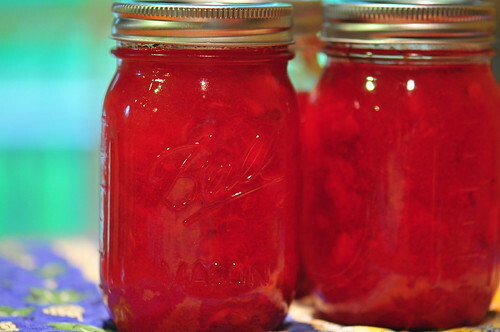 Pour into jelly jars and let stand at room temperature for 24 hours. so far my jam was too runny , then too thick...sigh.....I will try your recipe and hopefully I can get the right consistency! thanks for sharing a wonderful story and your Nonna' recipe! This is one of my favorite jam. Great with a piece of cheese on bread. And I was lucky as a child, too. Mom used to make a variety of jams and they would never finish. Chef Dennis, Well, I can tell you that both my mom and Nonna emphasized the importance of following the directions exactly as is. Good luck! Zerrin, Jam and cheese? Count me in! We've never actually finished all of our jam either. I've never once heard the phrase "we're out of jam!" It's possible that there are jars in the back of the big freezer from 80's.